As the Brazilian arts scene becomes a "battleground" for cultural wars, Christians and conservatives have reportedly been protesting against a number of art exhibits and plays, including one which portrays Jesus Christ as a transgender woman. The Associated Press highlighted several controversial cases gripping Brazil, including court battles to get "The Gospel According to Jesus, Queen of Heaven" theatrical performance banned. "In Brazil, we have a very ugly habit of sweeping everything under the carpet," said Renata Carvalho, the actress who performs the one-woman controversial show. ''This just sheds light on what people think. I think it's excellent that the masks are falling." The "Queen of Heaven" show has been put on more than 60 times in a tour throughout Brazil, despite conservative Christians petitioning to courts for a ban. "The performance of this horrific spectacle is equal to the persecution suffered by Christians in the first centuries when they were thrown to wild animals in the arenas of Rome as a form of entertainment," one such petition reportedly read. An injunction was granted by one judge who called the play disrespectful," ''aggressive" and "in bad taste," but that decision was overturned on appeal. Other injunctions have been rejected. 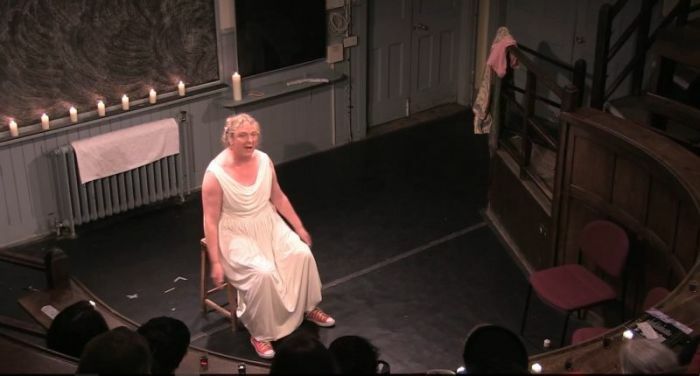 Christians in different countries have also protested the play, including the version performed by Jo Clifford in the U.K.
"The play imagines a transgender Jesus coming back to the world today," Clifford said in 2015. "She pitches a sermon and tells a few very familiar Gospel stories." "She has a communion, shares bread and wine with the audience, which is really a gesture of solidarity in the face of death, and she gives a blessing," Clifford added. The production attracted close to 300 protesters when it was staged in 2009 in Glasgow, Scotland. Demonstrators sang hymns and carried placards with messages reading: "Jesus, King of Kings, Not Queen of Heaven" and "God: My Son Is Not a Pervert." Evangelicals have grown in number, AP noted, and now account for one in five people in the predominantly Roman Catholic country. LGBT activists and Brazil's evangelicals have clashed over a number of issues, including a decision by Judge Waldemar Claudio de Carvalho in September in favor of a Christian psychologist who offers what critics call "conversion therapy" for homosexuals. Psychologist Rozangela Justino, whose license was revoked in 2016 after she offered therapy concerning sexual orientation conversion, has stated that religious guidance can help people who are gay.